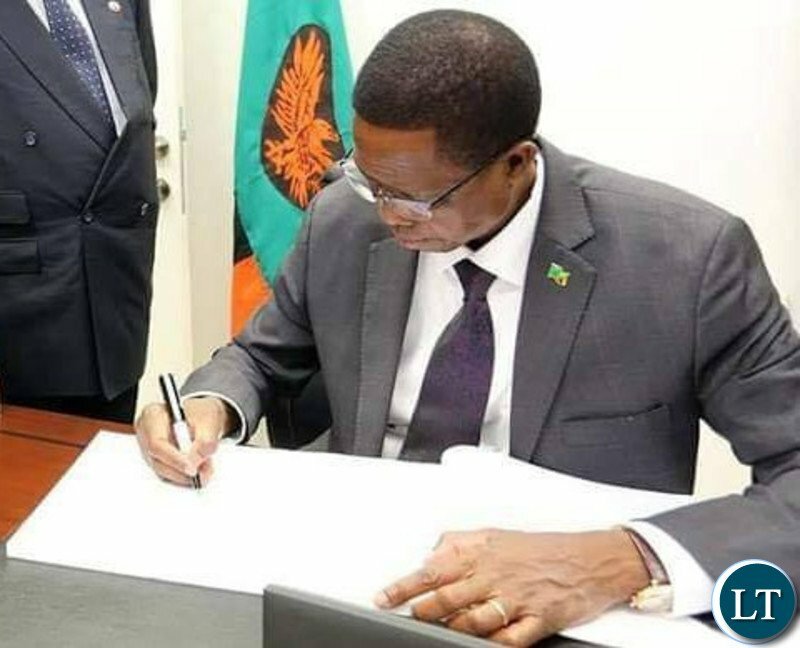 President Edgar Lungu has assented into Law, the National Dialogue Bill. The Bill was signed on 9th April 2019 to facilitate for processes that Justice Minister Given Lubinda announced in Parliament. Presidential spokesperson Amos Chanda told a media briefing at State House that the Ministry of Justice will now handle all the remaining processes. The National Dialogue amendment bill passed its third reading in Parliament early this month after it was tabled by Justice Minister Given Lubinda. The objects of this law are to facilitate the implementation of the Siavonga resolutions of political parties relating to constitutional and institutional reforms, separation of powers and judicial independence, tolerance, freedom of assembly and civility in politics and electoral reforms. The law also seeks to provide for a national dialogue process to facilitate the Constitution refinement process and regulation of political parties, public order and electoral process reforms, establish the National Dialogue Forum and provide for its functions and provide for matters connected with, or incidental to, the foregoing. It sounds like Bill of Rights. Zambian Bill of Rights is written like that. Why call it dialogue? Dialogue Ba Edgar means “discussion over a beer”. Dialogue is an agreement to dialogue. It can’t be forced. In this scenario, one can forsee a situation where a meeting is called and parties required to attend because it is law but remain silent in the meeting. They will simply declare that they have nothing to say. What purpose will that achieve? Continued anarchy that’s all. That is progress Mr POTROZ. Progress is key for the nation. All parties resolved to have this thing going. It’s a Legislative duty and long overdue. It’s a legislative duty being championed by the executive branch, violating the very tenet it is designed to address: separation of powers. What kind of ignorance is this? ….the source of the honey. 9th was Tuesday …he was flying to Roan for three days after coming from Luapula and Kabwe. The man is totally useless as they come…making laws to fix someone only backfire on yourself!! I notice on this platform you only accept postings which are pro UPND. This arrogance devalues your posture as a neatrol platform. It’s not our fault that the majority of PF supporters are illiterate you bum. Can’t even spell ‘neutral’ smh. Yet your complaint registered. How ironic! Mugubudu – sums up the silly fooools in PF constantly worried about who has said this and that..whether this foool stood next to him is a UPND cadre …even genuine sober PF voices are sidelined in preference for bootlickers, Kaponyas…you expect everyone to be happy and contribute solutions yet you can not listen to anyone. Mugubudu my dear friend LAZY LUNGU has had it very easy so far imagine RB had 3 times what is in the foreign reserves, the economy was sound, prudently managed, lines to credit facilities everyone was paid on time yet he got a lot of stick from opposition now fast forward 24 months from now when those EUROBOND and Chink debt kick in …Zambia will be like Zimbabwe and DRC. This lazy moron didnt even have time to read this bill…I mean the foool just returned from Kabwe on the 9th and was heading to Roan: when did he read it…how can you call something dialogue when you face imprisonment for not attending. These laws will backfire on these foooooools when they are in opposition…the only people that will be making money are the ZCID of this world. The dunderhead that just signs stuff without reading. This president ch!puba ok. He is a chiiipuba indeed…he had time to dance on stage but never in his term has spoke about this bill. Indeed dialogue is by agreement not by law with consequences, this to the best of my memory is the worst law we’ve ever had, even Kaunda’s One Party Participatory Democracy was not FORCED, note it was called PARTICIPATORY democracy.. and for those supporting, the churches with notable following have said they’ll not participate, those who will are the money hungry,influence seeking,loud mouthed but with no national following, let alone international….they can even support their own death warrant without reading. It. LAZ President advised trib.als to participate and avoid the pitfalls of boycotts, I have not heard any comment from upnd trib.als or other trib.als. Who danced for mahala in luanshya? Ba kopala munavinisa muntu mahala. How will this law be applied in relation to our constitution? Does it replace the need to consult citizens on issues pertaining to bill of rights, elections, governance and more? I hope it will not be used to circumvent established process for amendments of constitution and other key democratic instruments. Let’s wait and see. LAZ any comments? PF govt are very sharp. When the opposition have caputured the church. The PF govt have gone legal by passing thru Parliament. Your pseudonym rightly describes you. Fake Zambian. Blogging is now so boring because some bloggers are so predictable with their insults and ill-mannered writing without giving any tangible solution. If anything happens and takes headlines in Zambia all the UPND ” diehards” both local and economic refugees such as those whose Bloggs are always there”They know it all” look out for economic refugees from the Union Jack flag you will know what Iam talking about. They always praise the past as long as they are in the present everything is rubbished. But they have such short memories that the things of the past they are praising now they rubbished them yesterday. What a society of insolent an appreciative and arrogant lot. What is the position of LAZ on all this?